This course will take place in Berlin, Germany in May 2018. Germany is the birthplace of modern dance, and dance and theatre production dramaturgy. The country’s history is interwoven with its dance, music, art, literature, architecture, religion, and history. In addition to the direct dance training and rehearsals, students will see performances and visit museums and other cultural sites in one of Europe’s most exciting capitals. The German Contemporary Dance Program runs every three years. Students will be immersed in the culture of one of Europe’s artistic and intellectual centers. 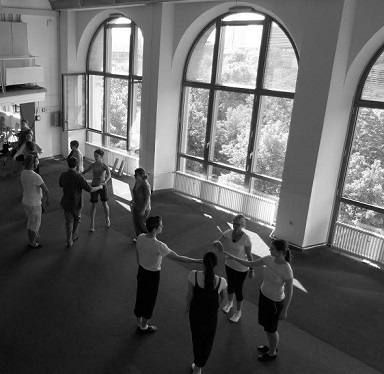 The program includes dance technique classes, rehearsals, lectures, and readings on contemporary issues in dance, an important part of German cultural history. Classes, lectures, and rehearsals will take place at the Uferstudios Center for Contemporary Dance, and the Tanzfabrik Berlin. Students will take daily technique classes with German dance artists in contemporary dance, as well as learn choreography from German choreographers. The performance aspect of this course will culminate in a showing at the Uferstudios. Oakland University students will perform their own works from Oakland Dance Theatre productions as well as new works learned in Berlin. Participants will enroll in DAN 4995, a 4-credit course taught by Dr. Elizabeth Kattner during Summer Session I. Program costs include accommodation, all educational activities in Germany including dance classes, rehearsals, concerts and other events, city tours, and daily breakfast. Airfare to Berlin is not included; students will book their own flights. For more information, visit the German Contemporary Dance website, or contact Dr. Elizabeth Kattner by e-mail at kattneru@oakland.edu. Payments will be refundable only in the event of emergency or if the program is cancelled. Requests for refunds (except in the case of program cancellation) will be considered on a case-by-case basis.